Don't leave the dock without knowing the rules of the road. This seminar simplifies the sometimes complex U.S. Inland Rules and International Rules, or COLREGS, for the recreational boater. Through examples, you'll discover how to avoid collisions in various situations, the differences between power and sailboat rules, and the special rules for fishing vessel. This seminar includes Student Notes with slides. 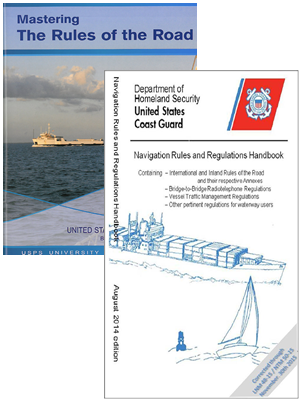 The downloadable US Coast Guard's Navigation Rules and Regulations Handbook is the supporting text. This seminar is also a starting point for study preparation for the USCG License examination.